Our sweet surprise for a new little one always makes a splash! 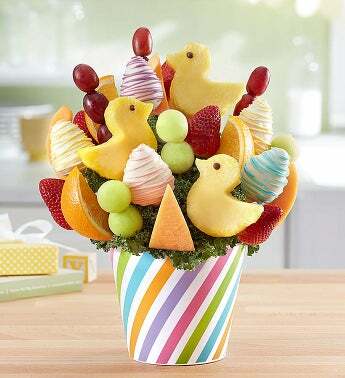 Ducky-shaped pineapple slices are joined by dipped & drizzled strawberries, melon and more in this deliciously adorable arrangement, perfect for baby showers or as a treat for the proud parents. Add to their bundle of joy with a cuddly plush bear and festive balloon.